9 cottages in the facility are large and small from 2 to 20 people, rich in variations and old houses from the log house. While not having a meal, by attaching an option, you can plan a trip freely without disturbing your own "richness". Private open-air bath is available on site. In extraordinary situation, please please make yourself at home unwind and relax like home. Mori no Cottage log house with the largest presence in the Mori no Cottage.Brick decoration is cute and popular! 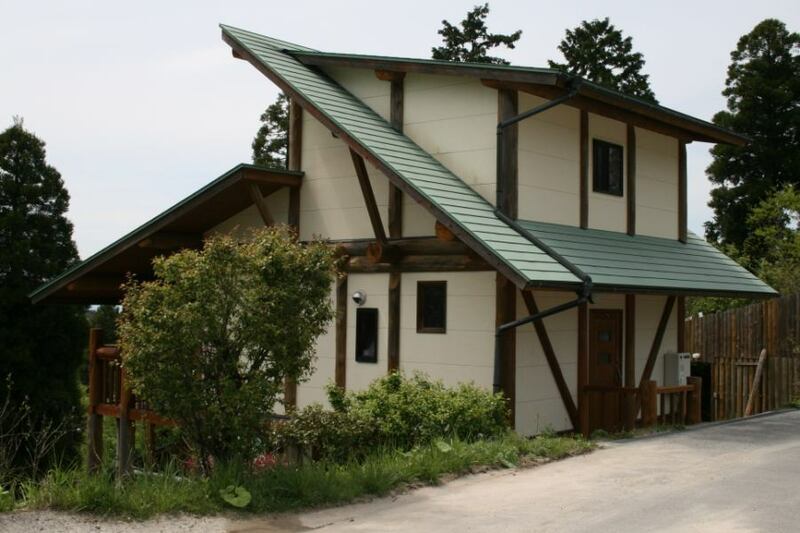 Mori no Cottage is the largest cottage in the Mori no Cottage. A log house that matched nature using authentic logs, sticking to trees! The terrace is also wide, ideal for those who want to spend time with a large group of people! Reservation of the outdoor bath adjacent to this log house can be made with priority by those who book this log house.It is an unusual open-air bath, which is now rare, and can be used freely from 17 o'clock to 23 o'clock for 1500 yen. It's definitely a luxury cottage life! Beds are not installed.We have your futon on the self. 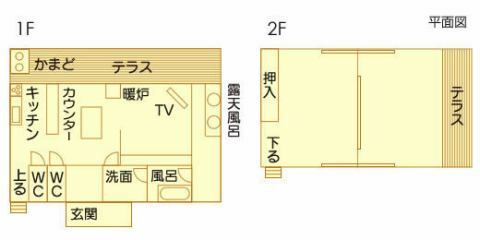 The bedroom space on the 2nd floor is divided into three, and it is possible to use it together with a group of men and women. 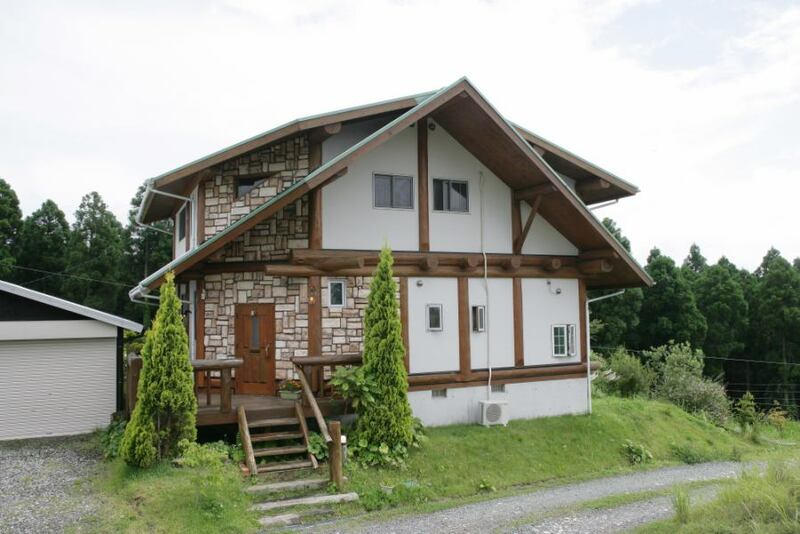 Appearance of log house for 10 people.Fashionable exterior and convenient location as administrative building are popular. Log house that used luxury logs in full swing. The characteristic of this building is that there is a large inside bath and a single bedroom in our facility. The inner bath is half shallow, so we can chat for a long time while talking with each other and plenty of opening feeling because the skylight is on! Building a colonnade, the sign of the first floor is felt from the space of the bunk bed on the second floor, and those who want to rest at ease are privacy secured in a private room! 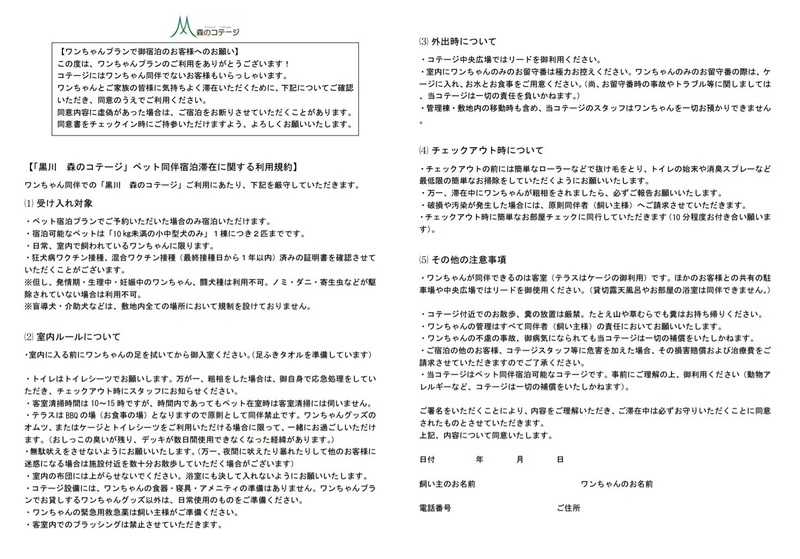 Various usage methods are possible, it is recommended for small children and elderly people, also from overseas customers. There is a staircase from the first floor to the second floor.It is the warmth of the wooden stairs. 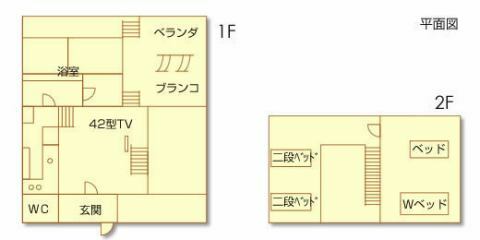 Two bunk beds × 2, single bed × 1, semi-double bed × 1, other futon sets are covered by self-service. There is a private room with a bed, privacy can be secured. Old-fashioned house I, the first class architect Kazu-kun's passion was condensed and completed. Not only the overall taste but also the details are devised, there are parts that are remade by the material of a real old private house. 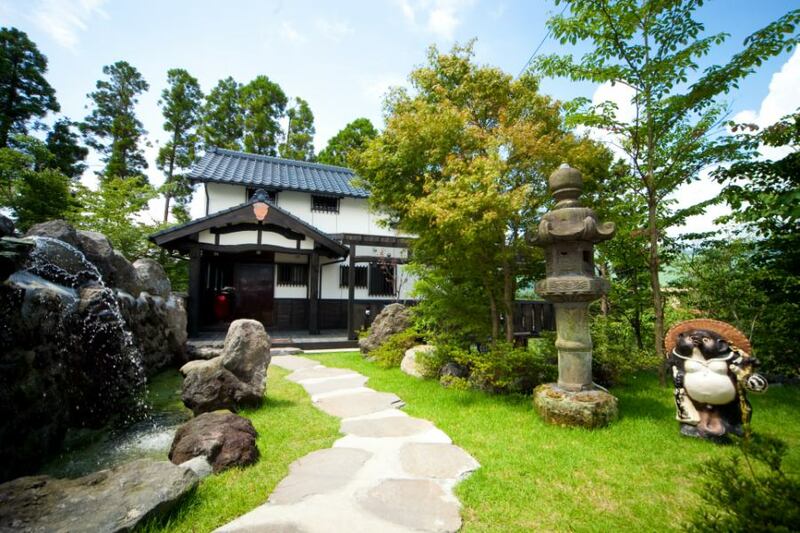 The characteristic of this building is an old-fashioned approach approaching the entrance.If you go through the gate like a samurai residence, the old private house mood will rise at once! Because there are no beds and tatami rooms, it is popular widely from babies to elderly customers. It seems to be an old private house, and there are facilities such as wood stove and hearth furniture, you can enjoy the experience a long time ago. 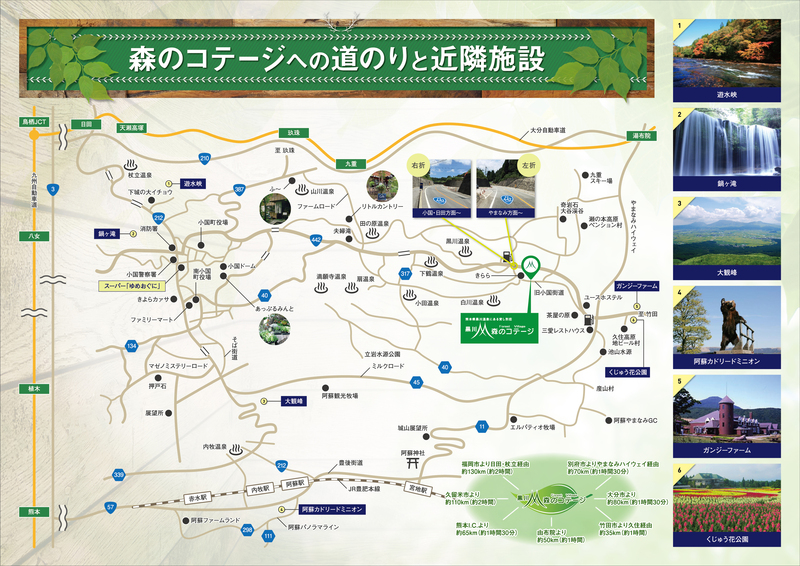 In addition to the inner bath (rock bath), there is a private outdoor bath and Goemonburo which can go from the inner bath as it is, you can use it freely during your stay. 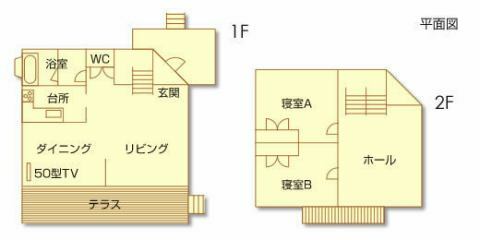 There is a staircase from the first floor to the second floor.It is a stairway of an old private house style wood. No bed.We have your futon spread by self-service. Exterior of old houses Ⅱ.It is tasteful wood tone. It is a new building of an old-fashioned house built by condensing the passion of first-class architects, Kazu-kun. Of course, there are ingenuity in detail as well as the whole atmosphere.A remake from a genuine old private house is everywhere, such as a beam and a front door ....Wood stove, hearthside, furnace can be actually used, optional, please experience. 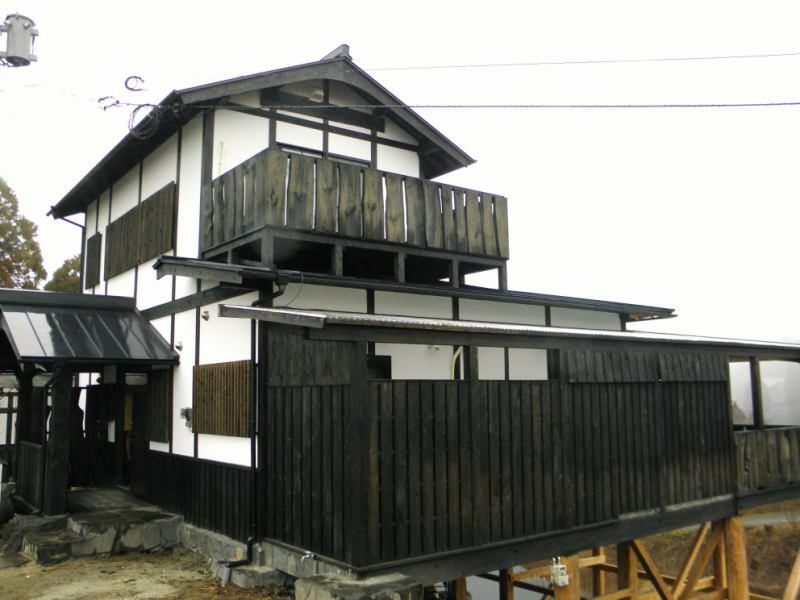 Also one of the features of this building is the terrace of nice view overlooking trees around the Mori no Cottage.On the covered terrace, there are also two tables that look like old houses.A rain barbecue in the group is also possible. 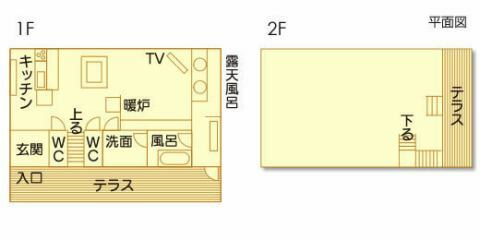 The bedroom on the second floor is a full flooring that can be partitioned.It is easy to use even for male and female groups. The futon is spread by self-service. 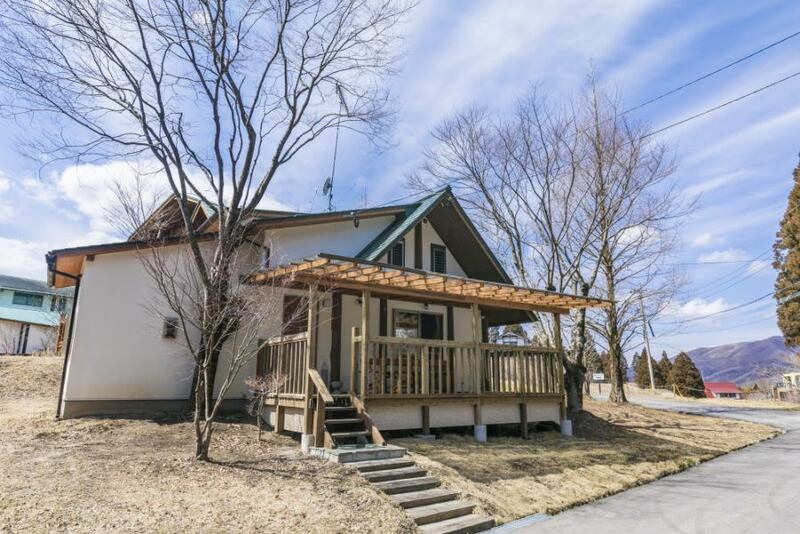 There are facilities like old private houses (wood stove, hearth furnace, oven) and options are available.The covered terrace is large and you can relax in the nice view of the forest. 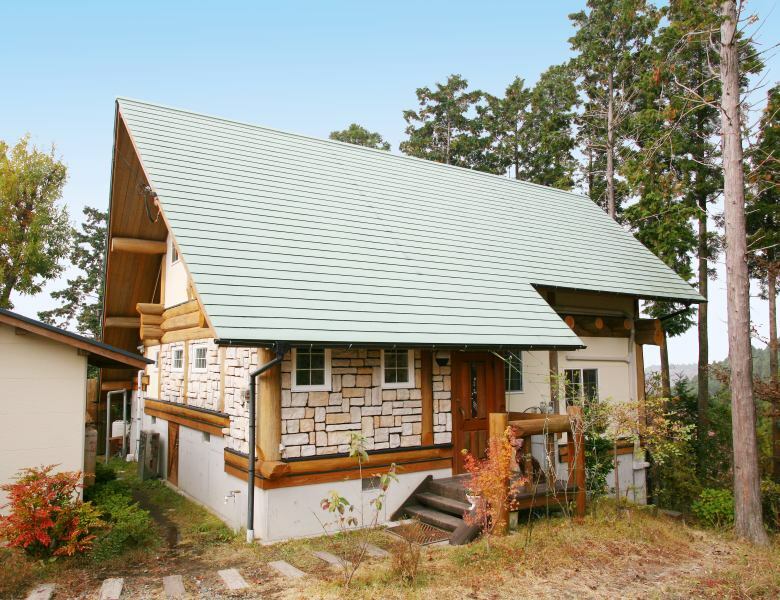 Three buildings for 6 people cottage are green roof, two-storey cottage with warmth of wood. The characteristic of this building is the structure that matched the warmth of wood with nature, and the living room with a relaxing size. On the 2nd floor part, set up a bunk bed sticking to wood! Children are pleased. Building a colonnade, you can feel the sign of the first floor from the space of the bunk bed on the second floor. 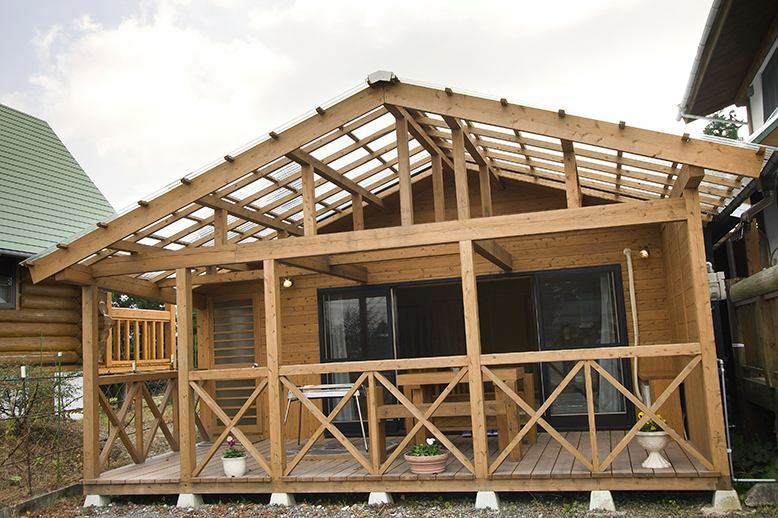 Of course the roof is attached to the terrace and the rainy day is safe as well.Because the three buildings are lined up on the hill, it is ideal for use with multiple groups. 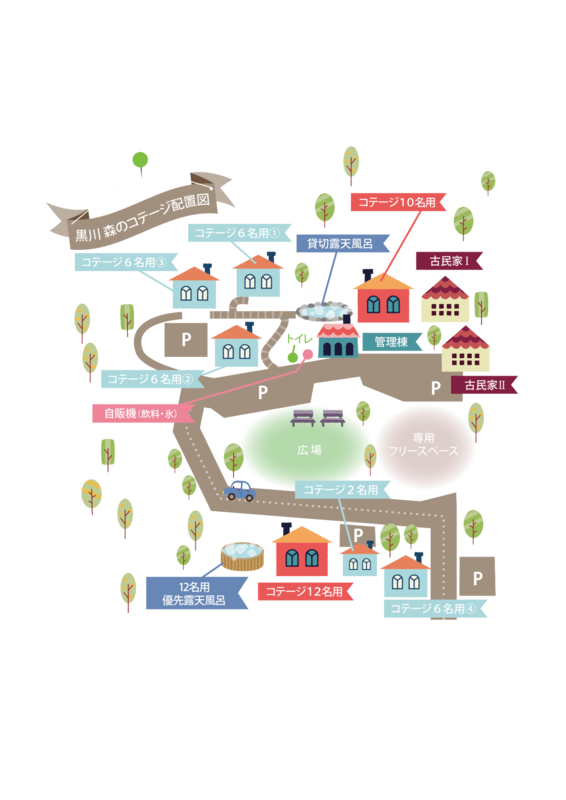 ※The pet plan is a cottage of this type. There is a staircase from the first floor to the second floor.It is the warmth of the wooden stairs.※There are some slopes and stairs to the entrance. 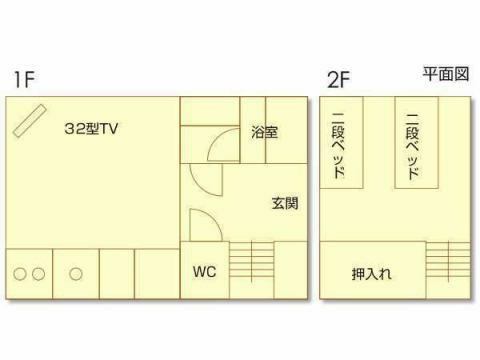 Two bunk beds × 2, other futons are covered by self-service. Two floor log house with bunk bed.Living room is a colonnade. There are 4 cottages for 6 people, but basically you can not choose the type of building.We are trying hard to optimally tailor the building according to customers and circumstances, such as babies, elderly people, check-in time, when snowing.In case we receive your request, we will do our utmost care, but please reserve after acknowledging that we may not meet your request. This building is the newest cottage in the Mori no Cottage cottage.It is a two-story building, a living space that calms down for not being colonnade. Built on a flat field a little away from other cottages, it is ideal for families with infants and children who want to stay quietly and for elderly customers. Although the inner bath is contemporary rather than rock bath, the quality of spring is the same as other cottages and private outdoor baths, it is a spa with high metasilicic acid value (hot spring, heated only). It is about 5 to 7 steps to the entrance.There is a staircase from the first floor of the indoor to the second floor. Two-storey cottage with warmth of wood.There is no bed in the flooring on the second floor bedroom. I am standing in the middle of the cottage square.It is slightly American look. Mori no Cottage, only this building is making a flat shop.Because it faces the central square of the cottage, you can see the square from the terrace. There is a counter in the kitchen, breakfast, chatting in the evening, the atmosphere is up here! There is also a secret hearth at the counter, so if you wish, please apply by option. 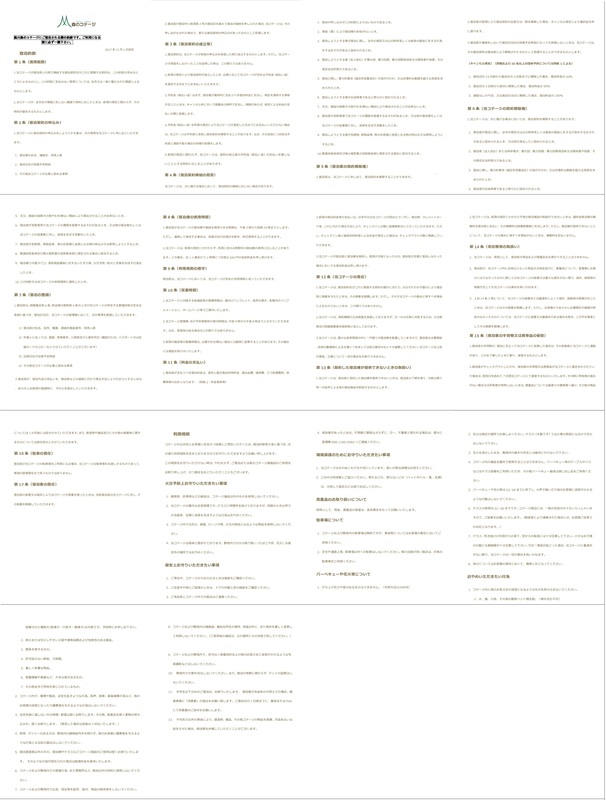 Although it is not large, reasonable and functional making is popular accordingly. There is none.It is a flat store on the first floor only. There is no bed.The futon is spread by self-service. A flat-house detached house.There is a covered terrace facing the central square. Surrounded by the central square, there are nine buildings centered on the administrative building. Even when you use multiple cottages in a group, you do not have to worry.